Just a couple of months back from the present now! And that break last summer is but a distant memory! My favorite post of the month is my monthly passive income update as it shows each month how I am getting a step closer in developing enough streams of passive income to supplement my working income and achieve financial independence. I’ve been steadily increasing my projected income, so let’s see how October actually turned out! Lending Club: Well that sucked! Hitting my lowest amount since April, my Lending Club investments definitely took a hit right on the chin. However, there is no reason to mope considering I still earned $126.92 of net interest during the month. Must be tough to have triple digits of passive income from just one of my investments in the bad months! That being said, even with a down month I am increasing my account balances each month setting myself up to continue to snowball the passive income. I would expect each reinvested $100 to bring me an additional $10-12 per year of net interest income. With a few more years of compounding like this, it will be great to see the monthly amounts grow. As the end of October, my weighted average interest rates were 17.95% and 15.30% in my Roth IRA and taxable accounts, respectively, giving me the potential for high returns over the course of the next few years. I would expect that those two averages begin to move towards one another as the loans I’ve been able to select are averaging in the mid-17% range. For the month of October, my overall internal rate of return was 12.37% across both accounts. Again, not bad for a down month! Important to understand, I calculate my monthly net interest amount to be interest received less any charge-offs, defaults, and services fees in the given period. If you haven’t yet, check out my full October Lending Club update. Prosper Marketplace: Steady Eddy here continued to rock out the consistent net interest with another solid month. During October this new account earned $18.01 of net interest income, just a tick higher than in September and August. Since I’ve recently added some more capital in this account, I am expecting the net interest number to start increasing over the next couple of months as those dollars get invested. At the end of the month, my average interest rate of the notes invested in is 22.04%. I am really making great progress on my 2013 goal of $120 in net interest from Prosper, although I need to average almost $19 per month in net interest income to exceed my goal. If you haven’t yet, check out my full October Prosper Marketplace update. As with previous months, I plan on directly reinvesting all my dividends until my annual dividend income falls between $2-3,000 per year, allowing me to reinvest more selectively a few times per year. When factoring in the dividend reinvestments mentioned above, and any dividend increases to my portfolio, my forward twelve-month dividends increased to $1,258.07 from $1,239.48, an increase of $18.59. Pretty spectacular to see how compounding increases my projected income on a monthly basis! 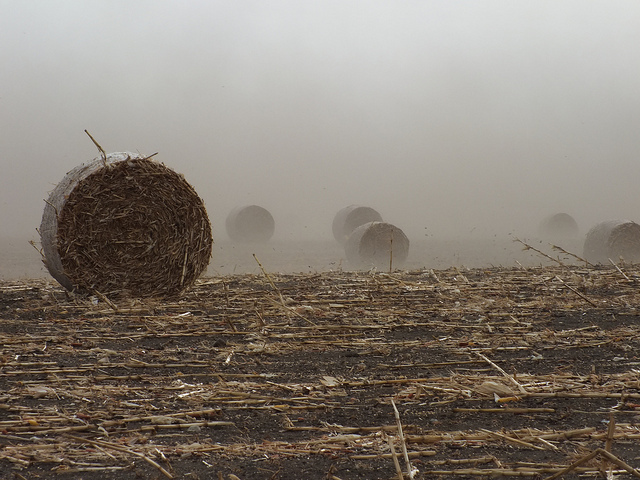 October was a down month from a passive income perspective for a couple of reasons. The first is the cyclical nature of dividend payments. In September I received over twice the number of dividends than I did in October. Nothing changed with the quality of my investments, just month companies do not pay out monthly. The second factor was the hit to my interest income numbers from Lending Club as I got hit with some charge-offs and defaults. This is just the nature of the biz, and I expect to continue to grow these accounts. Important to note is that I beat the previous period (October compares to July) by not quite $3 of passive income. So even with a down month I am continuing to grow my passive income! These quarterly swings are normal for those relying on dividends to produce passive income. As I said above, most dividend payers pay out quarterly thus creating the illusion of dips on a monthly basis. Because of this illusion of declining passive income due to timing, I’ve added a trailing three-month average to the chart below. This average will smooth out and better reflect the growing stream of passive income I am generating with my investments. 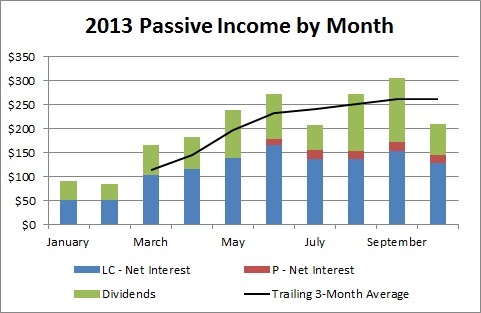 Overall, the down month did give me some pause as it comes to hitting my 2013 passive income goals. As of the end of October I need $575.78 of passive income, with $303.75 of it required from Lending Club. Knowing that November will be a big month for dividends, I can only hope my peer to peer lending accounts can pick up the remaining slack! And with that, we’ve reached capped off another passive income update. Without a ton of time or energy my investments earned $208.64 of total passive income for me during the month of October! What types of investments have you found successful in generating a consistent and increase level of passive income? Don’t hesitate to look around; you can find details on the various aspects of my passive income pieces under their respective pages, Lending Club, Prosper, and Dividend Growth. Additionally, you can find all of my monthly updates under the Passive Income Updates page, and progress on my 2013 goals on the Goals page. A bad month and you still earned over $200 with little effort. That’s progress. What was the reason for the down month? Were there some late payments with the LC/P accounts because it looks like the dividends were an increase from July. The reason for the down month was my Lending Club Roth IRA account. I saw one charge-off and one default during October, and those principle losses ate up some of the interest income earned. Just a part of peer to peer lending and expected with an account of my size and risk tolerance. Of course I say a down month but still earned an annualized 12.37% return in October. Thanks for stopping by JC! That is a very nice amount of passive income WYR! I am sure you are covering a decent amount of expenses with it.. And as DM mentioned, your snowball is starting to slowly but surely compound in the right direction for you.. I appreciate that DGI! Certainly it doesn’t hurt to cover some bills with the passive income, although much like yourself, the journey isn’t quite complete yet. Working on that as fast as I can! Been a long road to catch up! Thanks for stopping by! I just wanted to ask you what happened with your LC account and you just explained it. Well, it is still a good income and nice progress. Good luck and I am looking forward to see how you progress. I am staying low in LC and trying to decide what to do next. Certainly I understand why you are staying low in Lending Club. Anytime someone limits your ability to game the system it means it is time to reexamine how you are investing to begin with. Thanks for stopping by Martin. Still a solid month there. Over $200 is very nice. That covers a cell phone and gas for many people. The snowball continues to build. Looking forward to seeing you continue to catch us up on the passive income. I certainly can’t complain about earning over $200 of passive income. As for catching you, that is going to be tough, but I’ll see if I can swing it! Thanks for stopping by DM! Great job w2r, especially impressive that you still had QoQ growth despite the default and charge-off in the LC account. Ah, the beauty of diversification! Can’t wait to see if you hit your annual goals. Definitely tough to see the defaults, but that is the nature of the game and an accepted reality with my style of investing with my peer to peer lending accounts. Thanks for stopping by DMU!